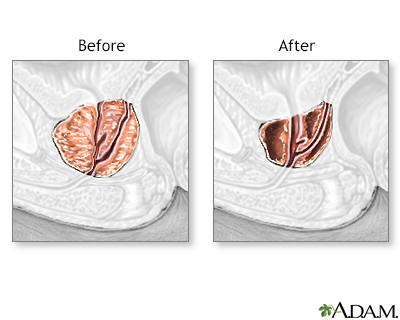 An enlarged prostate gland compresses the urethra, causing problems with urination. Prostate enlargement is caused by prostate gland overgrowth (benign prostatic hypertrophy or hyperplasia) or in some cases, prostate cancer. With an anesthetic (general anesthetic or spinal), a special kind of telescope, called a resectoscope is inserted through the urethra into the prostate. The resectosope is used to remove the blocking portions of the prostate. Transurethral resection of the prostate (TURP) is the most common type of surgical procedure for benign prostatic hyperplasia (BPH). TURP is typically successful at removing the symptoms of an enlarged prostate.